The black-tailed jackrabbit does not migrate or hibernate during winter and uses the same habitat of 0.4 to 1.2 mi2 (1–3 km2) year-round. Its diet is composed of various shrubs, small trees, grasses, and forbs. Shrubs generally comprise the bulk of fall and winter diets, while grasses and forbs are used in spring and early summer, but the pattern and plant species vary with climate. 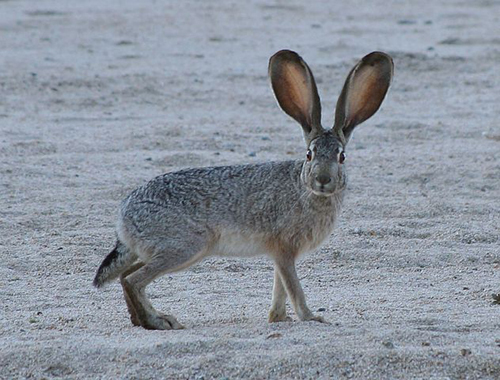 The black-tailed jackrabbit is an important prey species for raptors and carnivorous mammals, such as eagles, hawks, owls, coyotes, foxes, and wild cats. The rabbits host many ectoparasitesincluding fleas, ticks, lice, and mites; for this reason, hunters often avoid collecting them. Efforts on every scale from international to local, cooperatively and individually, are increasingly responding to this stark reality by setting aside land and regions of the seas as preservation areas which are now being protected to various extents. President Barack Obama has taken again this past week action to invest and conserve America's natural treasures. President Obama commented on the 12th of February 2016 upon designation of millions of acres in three new national monuments in the California desert to bring the land and sea he has protected to 265 million acres: "Our country is home to some of the most beautiful God-given landscapes in the world. We’re blessed with natural treasures – from the Grand Tetons to the Grand Canyon; from lush forests and vast deserts to lakes and rivers teeming with wildlife. And it’s our responsibility to protect these treasures for future generations, just as previous generations protected them for us." The new national monuments encompassing 1.8 million acres are the Mojave Trails National Monument, Sand to Snow National Monument, and Castle Mountains National Monument. Secretary of the Interior Sally Jewell and Secretary of Agriculture Tom Vilsack joined members of Congress, state and local officials, and local business and community leaders in applauding the President’s new designations. They wrote, “The new monuments, located in San Bernardino and Riverside counties about one hour from the Los Angeles metropolitan area and one hour from the Las Vegas metropolitan area, protect approximately 1.8 million acres of spectacular landscapes, fragile wildlife habitat, unique historic resources, and important cultural sites. These newly designated areas bring to twenty-two the number of national monuments established by President Obama under the Antiquities Act, an authority exercised by sixteen presidents starting with President Theodore Roosevelt in 1906 and used to protect treasures such as the Grand Canyon, the Statue of Liberty, and Colorado’s Canyons of the Ancients. The national monuments, comprised exclusively of existing federal lands, will be managed by the Department of the Interior’s Bureau of Land Management and National Park Service and by the Department of Agriculture’s Forest Service. The proclamations direct the agencies to engage the public in comprehensive planning for the management of these areas, building upon the provisions outlined in the proclamations. The three designations all honor valid existing rights, and provide for continued use for training activities of the U.S. military. The Sand to Snow area of southern California is an ecological and cultural treasure, a microcosm of the great geographic diversity of the region. Rising from the floor of the Sonoran Desert to the tallest peak in southern California, the area features a remarkable diversity of plant and animal species. The area includes a portion of the San Bernardino National Forest and connects this area with Joshua Tree National Park to the east, knitting together a mosaic of spectacular landscapes encompassing approximately 154,000 acres of federal lands, including just over 100,000 acres of already Congressionally-designated wilderness, east of Los Angeles, California, stretch over 200 miles. Home to desert oases at Big Morongo Canyon and Whitewater Canyon, the area serves as a refuge for desert dwelling animals and a stopover for migrating birds. The archaeological riches of the Black Lava Buttes and the historical remains of mining and ranching communities tell of past prosperity and struggle in this arid land. The unbroken expanse is an invaluable treasure for our Nation and will continue to serve as an irreplaceable resource for archaeologists, geologists, and biologists for generations to come. The Sand to Snow area is famous for its oases frequented by over 240 species of birds, including the endangered Least Bell's vireo, southwestern willow flycatcher, and Yuma clapper rail, as well as the threatened coastal California gnatcatcher. Big Morongo Canyon, characterized by steep canyons, rugged terrain, and desert oases, is particularly high in biodiversity and is among the largest desert riparian habitats in California. It has been recognized as among the most important avian habitats in the State. Common birds found at Big Morongo Canyon include shore birds like the American white pelican, great blue heron, and green heron, raptors such as the Swainson's hawk, Northern Harrier, and American kestrel, owls, including the western screech-owl and great horned owl, and hummingbirds, woodpeckers, vireos, and finches. Additionally, 32 species of migratory birds of conservation concern have been identified in the Sand to Snow area, including eagles, sparrows, owls, hummingbirds, woodpeckers, and falcons, among others. The Sand to Snow area encompasses a rich diversity of geological and ecological resources…From the flat desert lowlands, the mountains thrust upward in stark relief, creating indelible beauty along with a unique diversity of resources and a rich history of human habitation and movement. Along this remarkable topographic gradient lies an unusually wide range of ecosystems, ranging from lowland Mojave and Colorado deserts to scrub and woodlands and Mediterranean chaparral to subalpine and alpine conifer forests. The area is home to 12 federally listed threatened and endangered animal species. Species include the endangered peninsular bighorn sheep, San Bernardino Merriam's kangaroo rat, Arroyo toad, Mountain Yellow-legged frog, and unarmored threespine stickleback, as well as the threatened Santa Ana sucker, Coachella Valley fringe-toed lizard, and desert tortoise. Amphibians and reptiles including the Mohave Rattlesnake, red diamond rattlesnake, rosy boa, desert spiny lizard, California kingsnake, Western whiptail, and Pacific tree frog also live in the Sand to Snow area. A tremendous diversity of other wildlife species also make their homes here. In the San Gorgonio Wilderness, black bears, mountain lions, bobcats, mule deer, and bighorn sheep can all be found. Species such as ringtails, kit fox, striped skunk, California ground squirrel, blacktail jackrabbit, and 19 species of bat live in the Big Morongo Canyon Preserve. San Gorgonio, so named after Saint Gorgonius by early 17th century Spanish missionaries, is just one name for this remarkable, region-defining mountain. The Cahuilla Indians call the mountain Kwiria-Kaich, which means "bald" or "smooth," and consider it among the sacred peaks of southern California. The Gabrielino Indians from the Los Angeles Basin treat San Gorgonio Mountain with reverence and refer to it as Akvangna. The Luiseño Indians consider San Gorgonio Mountain sacred and the older brother of Mount San Jacinto; both peaks were among the first born of Earth Mother. The Luiseño refer to San Gorgonio Mountain as Pewipwi. Thirty miles of the world famous Pacific Crest National Scenic Trail run through the Sand to Snow area, climbing 7,000 feet from the desert of Whitewater Canyon to Mission Springs in the San Bernardino National Forest. The history of this renowned trail dates back to the 1920s when the idea of a border-to-border trail was first conceptualized. Although the establishment of the trail took decades to fully materialize, today the trail is a national icon, highlighting the wilderness treasures of the American West. Covering a range of nearly 10,000 feet in elevation, the Sand to Snow area includes an extraordinarily diverse range of ecosystems from lowland deserts, fresh water marshes, and Mojave riparian forests, to creosote bush scrub ecosystems, and alpine peaks. Hundreds of springs rise to the surface at South Fork Meadows, the origin of the South Fork of the Santa Ana River. The Sand to Snow area has been important to biological and ecological research, as well as studies of climate and land use change, the impact of fires and invasive species management. The area has a remarkable species richness that makes it one of most biodiverse areas in southern California. The area is home to 12 federally listed threatened and endangered animal species. Species include the endangered peninsular bighorn sheep, San Bernardino Merriam's kangaroo rat, Arroyo toad, Mountain Yellow-legged frog, and unarmored threespine stickleback, as well as the threatened Santa Ana sucker, Coachella Valley fringe-toed lizard, and desert tortoise. 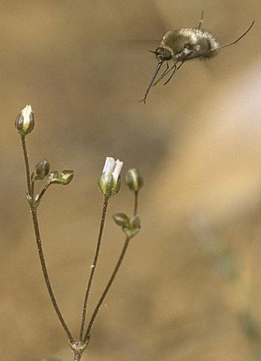 Bear Valley Sandwort, Arenaria ursina with bee fly. : Photograph courtesy of US Forest Service, no copyright. Cropped, by Scott Eliason http://www.fs.fed.us/wildflowers/regions/pacificsouthwest/BaldwinLake/in..., Public Domain, https://commons.wikimedia.org/w/index.php?curid=6398038The Sand to Snow area is home to dozens of native plant species, including 14 federally listed threatened or endangered species of flowering plants. These include the endangered California dandelion, Coachella Valley milk-vetch, Cushenbury buckwheat, Cushenbury oxytheca, pedate checker-mallow, San Bernardino bluegrass, San Bernardino Mountains bladderpod, Santa Ana River woolly-star, slender-petaled mustard, and triple-ribbed milk-vetch and the threatened ash-grey paintbrush, Bear Valley sandwort, Parish's daisy, and Southern Mountain wild-buckwheat. The southern-most stand of quaking aspen trees is located here as are important stands of white fir and bigcone Douglas-fir. The human history of the Sand to Snow area extends back thousands of years. People now identified as part of the Takic subset of the large Uto-Aztecan group of Native Americans arrived in the region around 2,500 years ago. Ancient people of the area used a wide variety of plants from both the mountains and the Mojave desert, such as honey mesquite, oak, piñon, cactus fruits, yucca roots, and tubers as well as grasses, seeds, and berries. Common tools were made of wood, bone, shell, stone, clay, and plant fibers. These people also manufactured woven goods, pipes made of stone, awls made of bone, tools associated with archery, and fire drills. They made coiled basketry and simple undecorated ceramic pots used for storage and transport. The name "Serrano" was given to people living in the Sand to Snow area by the Spanish missionaries in the late 18th century and translates from Spanish as a "person from the mountains." In 1834, the Spanish forcibly relocated many Serrano people to the missions. In 1840 the Serrano suffered a devastating smallpox outbreak, and the disease returned in 1860. Ruth Benedict, one of the world's foremost cultural anthropologists, studied the Serrano extensively in 1924. However, by this time there were few remaining eastern groups and no old shamans or priests survived. The protection of the Sand to Snow area will preserve its cultural, prehistoric, and historic legacy and maintain its diverse array of natural and scientific resources, ensuring that the historic and scientific values of this area remain for the benefit of all Americans. In addition to its significant scientific and historic values, the area also provides world class outdoor recreation opportunities, including hunting, fishing, hiking, camping, mountain biking, and horseback riding. Water in the aquifer underlying the monument is nearly 7000 years old. : Castle Mountains National Monument is surrounded on three sides by the NPS Mojave National Preserve. The Castle Mountains range and Johua tree (Yucca brevifolia) woodland, in the Eastern Mojave Desert and within Castle Mountains National Monument (est. 2016), San Bernardino County, California. Photograph and text courtesy of the US National Parks Service. The Castle Mountains area provides a critical linkage for plants, animals, and water between two mountain ranges within the Preserve, the New York Mountains to the northwest and the Piute Mountains to the southeast. The area's high quality desert habitat includes some of the finest Joshua tree forest in the Mojave Desert, as well as pinyon pine and juniper forest at the upper elevations. The area's native desert grassland is a hotspot of botanical diversity. The unique plant assemblage includes 28 species of native grasses, about half of which are rare, including burrograss and false buffalograss. Protection of this relatively intact and undisturbed habitat is important not just to the long-term survival of many plant species but also to significant wildlife populations. A herd of desert bighorn sheep lives on the steep, rocky slopes of the Castle Mountains. They and other wildlife traverse the area between the Piute Mountains and the New York Mountains. Numerous bat species live in rock crevices and mine remnants in the area. Wildlife species of special concern include the Townsend's big-eared bat, California leaf-nosed bat, Swainson's hawk, golden eagle, desert tortoise, Bendire's thrasher, and gray vireo. With its habitat linkages, wildlife corridors, and intact ecosystems, the area offers exceptional opportunities to study plant and animal movement and connections between diverse natural systems, especially in the context of climate change. Ongoing studies of desert bighorn sheep and other plant and animal species have shown the priority of this area for scientific research. A recent study using network models of bighorn sheep genetic and demographic connectivity as tools for landscape-scale conservation found the Castle Mountains habitat to be one of the most important in the Mojave Desert. Botanists are finding new and rare plant populations, and significant new information regarding the range of species such as Mexican panicgrass, in the Castle Mountains area. As a rare desert water source, Piute Spring attracted Native American habitation for thousands of years, followed by Euro-American exploration and settlement. Drawn to this reliable source of potable water, in 1867 the U.S. Army established Fort Piute (listed on the National Register of Historic Places) adjacent to the spring to provide protection to travelers on the Old Spanish Trail (known locally as the Mojave Road) that crossed the Mojave Desert from the Colorado River to San Bernardino, California. 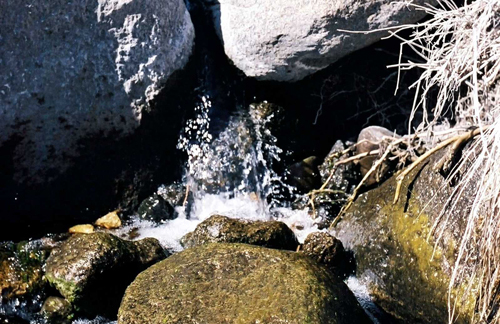 Maintenance of the groundwater resources and flow to Piute Spring is essential to the historical and scientific value of both the area and the Preserve. Presidential Proclamation -- Establishment of the Castle Mountains National Monument can be accessed at https://www.whitehouse.gov/the-press-office/2016/02/12/presidential-proclamation-establishment-castle-mountains-national. The Mojave Trails area is an invaluable treasure and will continue to serve as an irreplaceable national resource for geologists, ecologists, archaeologists, and historians for generations to come. The Mojave Trails area of southern California is a stunning mosaic of rugged mountain ranges, ancient lava flows, and spectacular sand dunes. It is a landscape defined by scarcity and shaped by travel. The area exemplifies the remarkable ecology of the Mojave Desert, where the hearty insistence of life is scratched out from unrelenting heat and dryness. This punishing environment has also forged the unique human history of the area, from ancient settlements uprooted by a changing climate to the armies of General George S. Patton, Jr., as they trained for battle in North Africa. With historic American trading routes, trails followed by Spanish explorers, a transcontinental rail line, and the Nation's most famous highway, the Mojave Trails area tells the American story of exploration, migration, and commerce. This unique landscape contains a stunning diversity of lava flows, mountains, playas, sand dunes, bajadas, washes, and other features. The area contains a number of significant sand dune features, most notably the stunning Cadiz Dunes, which have been extensively studied. The mountains of the Mojave Trails area include several significant formations, and seismologists have studied this area for insight into faulting, tectonics, and magmatism. A number of young volcanoes and their associated lava flows in the area have been heavily studied by volcanologists. Amboy Crater, designated as a National Natural Landmark in 1973, has been the focus of research on a number of volcanic phenomena. The Pisgah Volcano lava flow's vast network of lava tubes constitutes southern California's highest density of caves, and is used by both speleologists and recreational cavers. The area's terrain and geology have provided a surrogate for lunar and Martian landscapes, and many of the robotic and imaging technologies used to better understand volcanism and Aeolian processes have been developed and tested in the Mojave Trails area. Outstanding paleontological resources can be found throughout the Mojave Trails area. The Cady Mountains contain important fossil fauna assemblages dating to the Miocene Period. The Marble Mountain Fossil Bed area contains one of the classic Cambrian trilobite fossil sites in the Western United States. Set in the green-brown lower Cambrian Latham Shale, the fossil beds also contain the fossilized remains of brachiopods, mollusks, echinoderms, and algal bodies that are of great interest to paleontologists. The southern Bristol Mountains contain Tertiary fossils such as camel tracks, invertebrates, and numerous plants; this fossil history has also been used to understand the climate history of the Mojave Desert. Significant vertebrate fossils and other fossil resources have also been identified in Piute Valley and Cadiz Valley as well as the Ship Mountains, Little Piute Mountains, and Sacramento Mountains. The Mojave Trails area has been important for ecological research, including studies on the effects of climate change and land management practices on ecological communities and wildlife. It provides opportunity for further research on ecological connectivity in the Mojave Desert region, as it is among the most ecologically intact areas in southern California. The species that have managed to thrive here are specialists in perseverance and resourcefulness and are remarkable for their ability to withstand the desert extremes. The area's scarce springs and riparian areas such as Afton Canyon, Chuckwalla Spring, Hummingbird Spring, Barrel Spring, and Fenner Spring provide refuges for a wide variety of plants and animals. The complex network of groundwater underlying the Mojave Trails area has been the subject of past and ongoing hydrological study. Underground aquifers feed springs and seeps that are important for sensitive ecosystems and wildlife, though specific connections are not yet well understood. Rare plant species such as the scrub lotus, rosy two-tone beardtongue, whitemargin beardtongue, Emory's crucifixion-thorn, small-flowered androstephium, white-margined penstemon, and Borrego milkvetch rely on the specific habitat types found in the Mojave Trails area. The Piute Valley area in the northeastern part of the Mojave Trails area is home to the northernmost occurrences of smoke trees in the California desert, as well as the Homer Mountain Ocotillo Assemblage. The lowlands and middle elevations are also home to other unique or ecologically significant plants such as the endemic Orocopia Mountains spurge. Numerous cactus species are also found here, including the densest concentration of Bigelow cholla cactus in California. Ongoing research in the Mojave Trails area has identified other plant species that are new to science, many of which have not yet been described. Birds including the endangered Least Bell's vireo, southwestern willow flycatcher, and yellow-billed cuckoo depend on this area, as do raptors such as the burrowing owl, red-tailed hawk, golden eagle, American kestrel, and prairie falcon. Fragile desert fish species such as the bonytail chub rely on the scarce waters of the desert riparian ecosystems. A wide variety of fascinating native mammal species can be found in the Mojave Trails area, including the kit fox, ringtail, American badger, mountain lion, and bighorn sheep. Reptiles and amphibians, including the Mojave Desert's largest lizard, the chuckwalla, have been extensively studied in the Mojave Trails area. The area contains some of the Mojave Desert's best habitat for the threatened desert tortoise and provides important dispersal corridors for that fragile species. An unusual community of invertebrates associated with lava tubes in the Pisgah area offers an ongoing opportunity for entomological research. Humans have lived in and moved through the Mojave Trails area for more than 10,000 years. The archeological record tells of a human existence shaped by a changing climate. During the Paleo-Indian period, now-dry lakes provided fresh water to small groups of nomadic people and the animals they hunted. From around 7,000 to 2,000 BC, rising temperatures resulted in a change from wet to dry conditions. Associated ecological changes in the region led to new patterns of subsistence for native peoples. Although people remained closely tied to water sources following the temperature increase, desert inhabitants adjusted their diets to rely more heavily on plants and fish, invented new tools, and expanded the sizes of their social groups. During the Formative Period (2,500 to 1,500 BC), dry conditions meant the inhabitants of the Mojave Desert remained in small groups. They relied heavily for their survival on the Mojave River, a name derived from the traditional name for these people, Pipa Aha Macav ("the people by the river"). The Mojave people left their mark on the landscape through petroglyphs, pictographs, old trails, and stone work, some of which can still be found today, especially near springs and rivers and along the shores of now-extinct lakes. The Mojave were not the only people to use or pass through this landscape. Ancestors of the Chemehuevi Indian Tribe, a branch of the Southern Paiute, have been persistent occupants of the Mojave Desert for thousands of years. Sacred Chemehuevi trails are often tied to traditional and ceremonial songs. The Salt Song Trail, one of the longest song trails of the Chemehuevi people, passes through the Mojave Trails area near the town of Fenner and the Ward Valley. Natural land patterns form the route of this trail, with specific songs sung at specific wayside locations. Other Native Americans who have lived in or passed through the Mojave Desert include the Shoshone, Serrano, Kawaiisu, and the Paiute. The Ward Valley, located between the Old Woman and Piute Mountains, is sacred to a number of these tribes, as are the Mesquite and Crucero Hills, which contain over 50 archaeological sites including petroglyphs, milling stations, temporary camps, intaglios, lithic scatters, and pottery dating as far back as 4,000 years. The Mojave Trails area has been a critical travel corridor for millennia, linking the Pacific Coast to the deserts of the southwest and beyond. The Mojave Indian Trail is the earliest known travel route passing through the Mojave Trails area, used by Native Americans for thousands of years and by early Spanish explorers and traders. In 1829, Mexican explorer Antonio Armijo pioneered the Old Spanish Trail through this area. Evidence of the trail, now designated a National Historic Trail, can still be found at Afton Canyon. By the end of the 19th century, transcontinental rail travel had changed the American West in profound ways. In 1882, Southern Pacific constructed a railroad route from Barstow to Needles. In addition to the major rail stops established at Needles and Barstow, several smaller towns and rail stops were established along this stretch, including the alphabetically named Amboy, Bristol, Cadiz, Danby, Essex, Fenner, and Goffs. These towns remain, some as inhabited hamlets and others as abandoned ghost towns, and some historical artifacts from the original rail line still exist, including original rail ties and track and later improvements of communications poles, insulators, and wires. A modest dirt road -- an original trackside component of the railroad project -- would later become the most famous highway in America. In 1911, in the infancy of the automobile era, the County of San Bernardino paved the first stretch of that road from Barstow to Needles. The next year, this stretch became part of the National Old Trails Road, which extended more than 3,000 miles from New York, New York, to Los Angeles, California, and connected the American coasts by pavement for the first time. In 1926, the road was officially designated as U.S. Highway 66, a designation soon known around the world as Route 66. During the 1930s, Route 66 became an important route for migrants escaping economic hardships of the Great Depression and droughts in the Central plains. As the national economy rebounded following World War II, Americans took to the highways in unprecedented numbers. The road became an American icon, earning the nickname the "Main Street of America" and inspiring popular culture through music, literature, and film. The popularity of Route 66, however, hastened its downfall; increasing traffic quickly exceeded its two-lane capacity. In 1985, Route 66 was officially decommissioned, leaving behind a powerful albeit fragmented narrative history of America's automobile culture of the first half of the 20th century and its legacy of related commerce and architecture. The Mojave Trails area contains the longest remaining undeveloped stretch of Route 66, offering spectacular and serene desert vistas and a glimpse into what travelers experienced during the peak of the route's popularity in the mid-20th century. Today, the ghost towns along this stretch of Route 66 are a visual legacy of how the automobile shaped the American landscape. The protection of the Mojave Trails area will preserve its cultural, prehistoric, and historic legacy and maintain its diverse array of natural and scientific resources, ensuring that the prehistoric, historic, and scientific values of this area remain for the benefit of all Americans. Last year, President Obama announced the Every Kid in a Park initiative to give every fourth-grade student and their families a free pass to National Parks and all other federal lands and waters for a full year. A park can be a place, a passion or a state of mind. People all around America are finding their park every day. So get up. Get out there. Find your park. It might be closer than you think. Learn more at http://findyourpark.com. National Park Service PSA, Published on March 30, 2015.